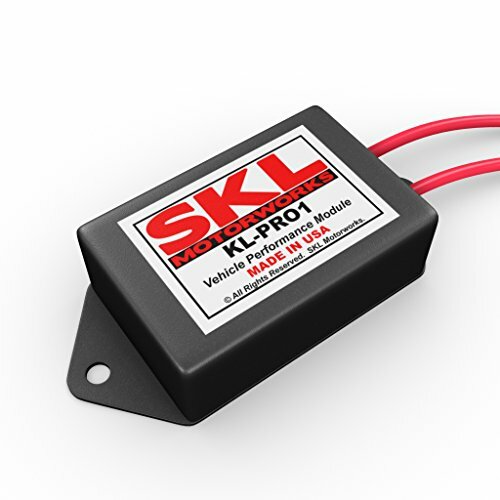 The SKL MOTORWORKS Perfomance Chip Tuning Module is designed to maximize the power or economy from your vehicles current setup. The Perfomance Module will work with a completely stock vehicle or with modified vehicles. Its easy to install, fully reversible, and in most cases requires no cutting or modification of your vehicle. The Perfomance Module is the answer to today's high fuel prices and our quest to squeeze that hidden power and fuel economy out of your engine. With our products you gain a horsepower increase of up to 20%, while gaining up to +5 MPG in fuel mileage due to increased engine efficiency! The way our products work is by sending a continuous signal through a factory engine data sensor that your Factory Engine Control Module (ECM) monitors. This modified and continuous signal triggers your factory ECM to reprogram itself for a more optimum fuel mixture and timing curve, allowing the full benefits of an expensive power programmer but while retaining the complete safety of your Factory ECM. Since the Performance Module does not directly interface with your Factory ECM and merely only sends a continuous signal through a factory engine data sensor, it will absolutely not leave any footprints behind in the memory since our products are simply triggering your Factory ECM to reprogram itself on its very own, being completely undetectable by your dealership. Our products are completely reversible and your Factory ECM will instantly revert back to the stock settings once removed! The SKL MOTORWORKS performance chip is a great high performance part for your vehicle. It will work with existing cold air intake and exhaust modifications as well as other mods. It will also work on stock vehicle. SKL MOTORWORKS PERFORMANCE CHIP TUNING MODULE - for your Ford Excursion LimitedL 4WD 6.8L SOHC V10 310HP will maximize the power and economy from your vehicles engine. Increase horsepower (HP) and torque up to 20% depending on your vehicle. Fuel Economy (MPG) increase of up to 20%. Our vehicle accessories will REDUCE EMISSIONS & INCREASE HORSEPOWER! View More In Engine Computers. If you have any questions about this product by SKL Motorworks, contact us by completing and submitting the form below. If you are looking for a specif part number, please include it with your message.